Following a memorable Messiah performance in December 2014, I returned to Brangwyn Hall in Swansea on Sunday 17th of December 2017 to perform another rendition of this, Handel’s most renowned oratorio, with the Swansea Bach Choir - under the direction of Greg Hallam, with the orchestra Musica Poetica London. 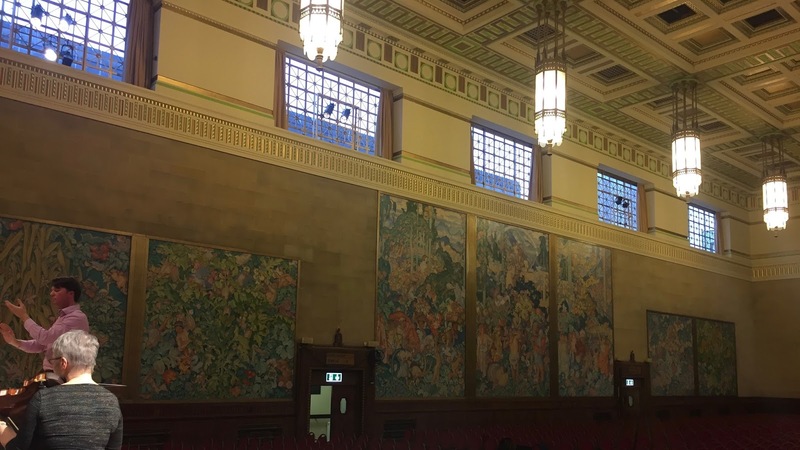 The impressive decorative panels adorning Brangwyn Hall, completed by the Belgian-born Sir Frank Brangwyn (1867 - 1956), gave an impression of the huge scale of the hall. The audience attendance for this festive occasion must have been close to full capacity (1070 persons). The large panels, commissioned in 1924, depict the dominions of the British Empire and were originally intended to be displayed in the House of Lords. This un-cut performance of Handel’s Messiah featured excellent singing from soloists: Alexandra Stevenson (Soprano), Martha McLorinan (Mezzo-Soprano), Rhodri Prys Jones (Tenor) and Frederick Long (Bass). What a stylish and moving Messiah by @swanseabach and @_greghallam with @muspoetica in @TheBrangwyn last night. Colour and vitality! Resplendent singing from colleagues @MarthaMcLorinan, @frederickjlong & @rhodrijtenor! The Swansea Bach Choir did an impressive job in all of the choruses; giving an engaged, precise and innately musical rendition of Handel’s Messiah. I had the pleasure of playing first trumpet with Will Russell on second. I enjoyed playing the full version of The Trumpet Shall Sound with the Bass, Frederick Long. Many thanks must go to the Swansea Bach Choir, to the conductor Greg Hallam and to Oliver John Ruthven, artistic director of Musica Poetica London. Thanks also must go to Theresa Caudle (violin) for leading the orchestra, and to Joanne Miller (viola) for driving a car-load of us to and from London.